Book Review Objects as Friends By Jos de Gruyter and Harald Thys Reviewed by Nicholas Chiarella Jos de Gruyter & Harald Thys' Objects as Friends reveals not only affinities but also breakdowns in relation between objects. The book is assembled in a straightforward manner, composed of around 300 images, each of a unique juxtaposition of objects. The objects are photographed against a gray wall on a drab cement surface coated in white dust. Some objects sit in a tensioned balance; most lean or stand together like friends and colleagues. Some immerse one another in coincidence of form. There are pairs, trios, and larger families of items. Objects as Friends. By Jos de Gruyter and Harald Thys. By Jos de Gruyter and Harald Thys. Walther Konig, 2013. Hardbound. 312 pp., 300 color illustrations, 10x10-1/2". Jos de Gruyter & Harald Thys' Objects as Friends reveals not only affinities but also breakdowns in relation between objects. The book is assembled in a straightforward manner, composed of around 300 images, each of a unique juxtaposition of objects. The objects are photographed against a gray wall on a drab cement surface coated in white dust. Some objects sit in a tensioned balance; most lean or stand together like friends and colleagues. Some immerse one another in coincidence of form. There are pairs, trios, and larger families of items. Some of these combinations feel like plausible representatives of the everyday: the contents of a desk drawer or a cabinet under the sink. Other configurations play at meaning: a pillow adorned with a curled wig becomes a head; a slab of asphalt and a plastic shopping bag reverse their roles in relation to the strip mall. 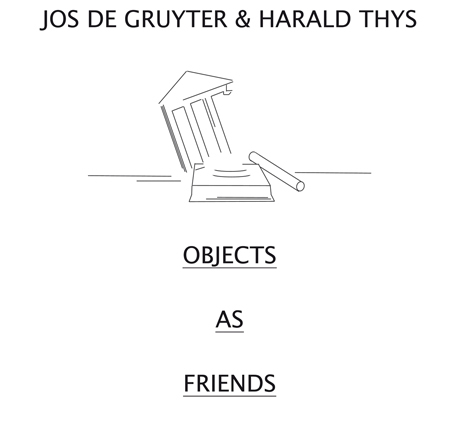 Objects As Friends, by By Jos de Gruyter & Harald Thys. Published by Walther Konig, 2013. Materials represent vast networks of information, coefficients of friction, characteristic absorbance of light, heat, and sound. They accumulate damage and dust as measures of durability and duration. They carry narratives of their use, abandonment, and purposelessness, and these narratives include the interactions between objects. The record of this exchange between objects might take the form of history, performance, or conversation. Gruyter and Thys’ arrangements are like the orchestrations of a director, drawing out tensions between objects as if they are strangers trapped in moments of decay, lacking resolve. The combinations that create the greatest amount of satisfaction require consideration of sympathies or tensions of color, condition, or placement. Unities emerge and affirm meaning, or at least its semblance. Unfolded in series, vignette after vignette, some of the ephemeral combinations persist beyond play or kitsch into neutral representations of ugliness. Consider the union of a yellowish green glass vase with blue rubber shower shoes: is it cruel to call this friendship garish, improbable, even excessive? These items unite toward the exiling of logic. Yet the composition on the facing page provides absurd relief: a bedpan, gray styrofoam mannequin head, and black plastic top hat. Are they presented as gradations of grayness and luster, dispersed across an unlikely combination of substances? Do they create an implicit joke about scale (the head would appear to fit easily into either the hat or the bedpan)? However, the shifts in balance such as between these two images are what maintain the accessibility of the book. Nicholas Chiarella is presently an administrative assistant and contributing faculty member at the Santa Fe University of Art and Design. He has previously coordinated education programs for 516 ARTS (ISEA2012) and for Meow Wolf and the Center for Contemporary Arts (CHIMERA). His poems and photographs have appeared in Santa Fe Trend, Slideluck Potshow, BathHouse Hypermedia Journal, the Mayo Review, and others. He drums for Santa Fe-based duo Alamo Sun, most recently collaborated on an installation with artist Martha Tuttle at Dwight Hackett Projects, and has contributed work to installations and group shows with Meow Wolf, Caldera, and The Tan.